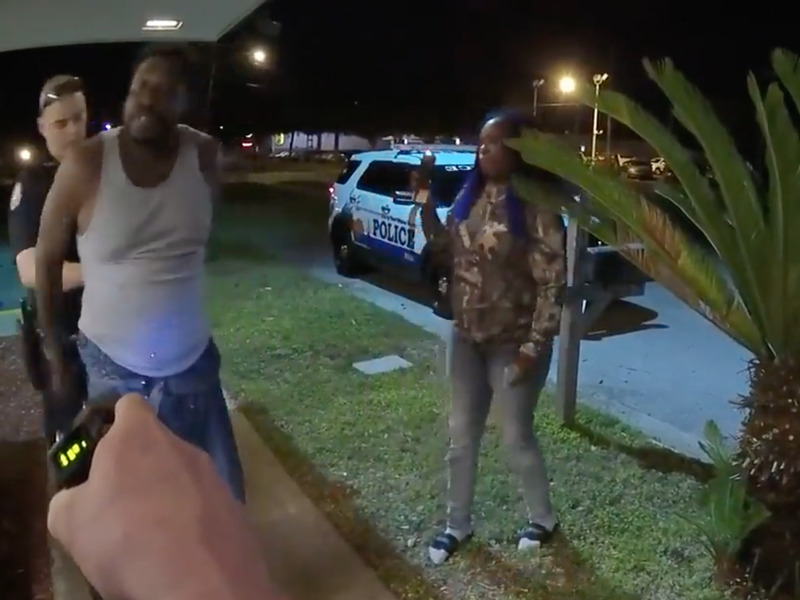 Shaun King, FacebookA couple was handcuffed outside of Waffle House after a disagreement over the check. A black couple was handcuffed by police officers outside a Florida Waffle House after a dispute with wait staff, according to footage that was posted by activist and journalist Shaun King to Facebook. Waffle House employees called the police after the customers argued they were overcharged by 50 cents on a drink that should have cost $US1. The incident follows two other instances in which black customers’ concerning encounters with police officers at Waffle House locations went viral. “We understand the concern over these incidents, and welcome continued communication with the community, its leaders and the customers involved,” Waffle House said in a statement. Waffle House is under fire after footage from a police officer’s body camera revealed a chaotic clash between a black couple and police officers at the chain. Footage posted by activist and journalist Shaun King on Wednesday shows police entering a Waffle House in Fort Walton Beach, Florida. In the video, two people are seen inside the restaurant, arguing with employees regarding the bill, which the customers say was overly high. In the video, the officer asks the woman and the man, who is speaking on a cell phone, to come outside. After a period of time in which the pair discuss reported issues with the bill, the couple goes outside. Outside, the couple and the police officers begin talking over each other. The police say that the bill needs to be paid or the pair will be arrested for theft, while the couple says that confusion regarding the bill needs to be cleared up first. The video shows both the man and the woman being handcuffed by police over their vocal protests. While not shown in the footage, the pair was not ultimately charged with a crime, and they paid for their meals. The woman returned to the Waffle House location later and received a full refund. The incident follows two other interactions between Waffle House customers and the police that went viral online. Chikesia Clemons was arrested at a Waffle House in Saraland, Alabama, in April. Cell-phone footage of the arrest, taken by Clemons’ friend, shows multiple officers physically wrestling Clemons to the ground, exposing her breasts. In May, Waffle House employees called police on 22-year-old Anthony Wall after he got into an argument with several workers at a Warsaw, North Carolina location. Footage Wall shared on Facebook shows an officer choking him and slamming him to the ground. “As anyone who has dined with us knows, we have a very diverse customer base and workforce,” Waffle House said in We have had a culture of inclusion since we opened our doors in 1955, and are very proud of the fact that our restaurants have been open to all. We understand the concern over these incidents, and welcome continued communication with the community, its leaders and the customers involved. With respect to the Saraland, Ala., and Warsaw, N.C., incidents, we concluded that our employees acted appropriately by calling the police in light of safety concerns for our customers and themselves. In the Fort Walton Beach, Fla., incident, our review of the matter is continuing. Our CEO, Walt Ehmer, called Ms. Sheffield the same day we received a letter from her, and said he would personally review the matter. As part of our process, we’ve tried to contact Ms. Sheffield several times, but she has not responded. We would like to talk further with her before we conclude our review.